Over the past few months, we've received numerous questions related to our apps, devices, and online therapy platforms. Below are our answers to a few of the questions received. Don't see your question below? Don't worry, we'll be posting additional questions and answers in future blog posts, and you can submit your own question on the form at the bottom of this post. A. Hi, Mike! Yes, we just added a brand new Knowledge Base to our website. The Knowledge Base has answers to frequently asked questions that we've received from customers over time. 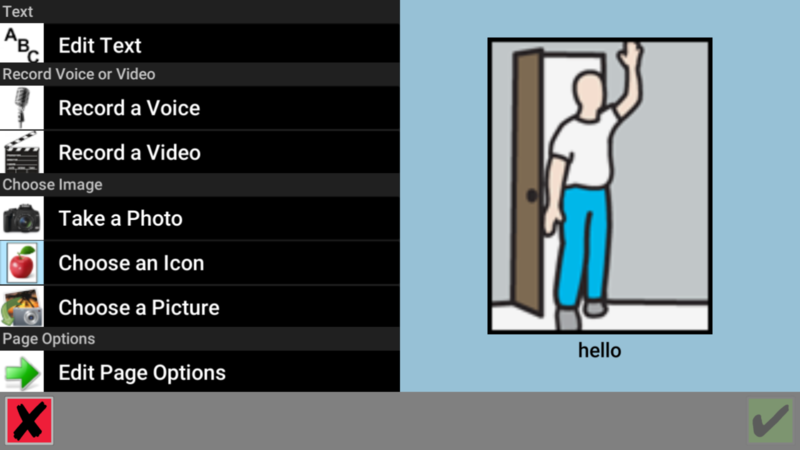 You can access the Knowledge Base by clicking here or by going to www.aphasia.com and selecting "Knowledge Base" from the "Help" drop down menu on our home page. If you can't find the answer to your question in the Knowledge Base, feel free to reach out directly to our team and we'd be happy to help! You can call us at 888-274-2742 or submit your question using our contact us form. A. Hello, Cecilia. Thank you for reaching out to us. To answer your first question, yes, we do offer financial assistance for our communication devices. If your insurance provider does not cover the entire cost of a Lingraphica communication device, we have partnered with two trusted companies, CareCredit and United Medical Credit, that may be able to assist you. By using either CareCredit or United Medical, you can apply for and potentially receive specialized payment options for a Lingraphica communication device. Click here to learn more about CareCredit and United Medical. 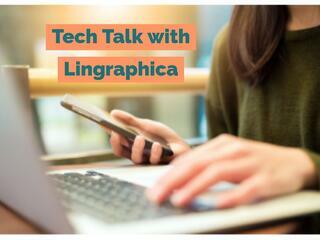 In addition to the two credit companies we partner with, Lingraphica also works individually with customers who can’t afford some of the costs associated with a communication device. Please call Lingraphica at 888-274-2742 and ask to speak with a Client Advocate for more details. PLEASE NOTE: You must already be enrolled in an active communication device trial with Lingraphica before you apply with one of our financing partners. Our reimbursement team will tell you when and if you need to complete this process. As for your second question, "Is an SLP required to use (your products)?" Yes, you will need to be working with a speech-language pathologist to trial our communication devices if you intend to use insurance for the device. If using insurance, the SLP must confirm that a communication device is necessary for the patient before it can be purchased. If you choose to purchase a device out-of-pocket and not go through insurance for funding, seeing an SLP in not a requirement. We hope these answers were helpful. If you still have questions, please reach out to us directly at 888-274-2742 or submit your question using our contact us form. A. Great question, Stephanie! 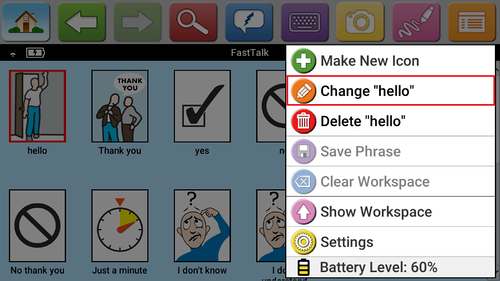 Yes, the icons that appear in the FastTalk section can be customized. 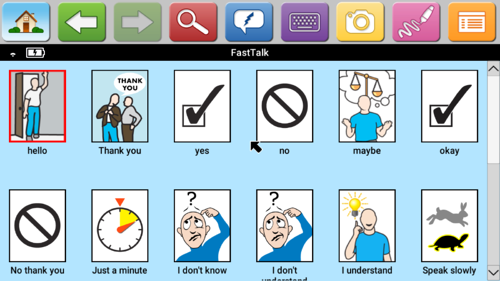 The icons that appear in this section were selected because those phrases and words are commonly used in everyday conversation. The icons can be rearranged, deleted, and edited to each individual's preference. New icons can also be created on this page and existing icons on other pages can be added as well. If you would like to edit the preexisting icons, select the icon you would like to edit. Once you select the icon, click the Orange menu button in the top-right corner of the button bar and click "Change (icon name)" in the drop down menu. You will then be taken to the icon editor where you can change the icon's text, image, and page options. If you need additional assistance, please contact our tech support team at 888-274-2742 or submit your question using our tech support form.